Howard Hanson : Symphony n°1 in E Minor, op. 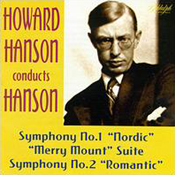 21 "Nordic"
Howard Hanson : Symphony n°2 in E Minor, op. 30 "Romantic"